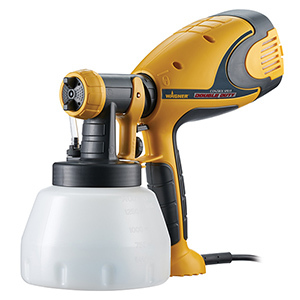 The Wagner Control Spray Double Duty HVLP Paint Sprayer uses high volume, low pressure technology and AC power to provide a continuous spray. 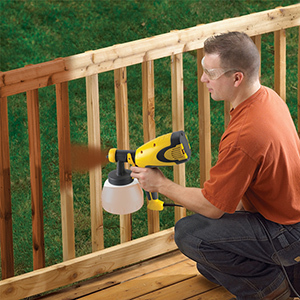 The two-stage air turbine provides a professional fine finish ideal for staining your deck or refinishing your cabinets. The sprayer is ideal for applying thin materials such as stains, sealers, urethanes, varnishes and lacquers. For use with oil based or water based coatings and for indoor or outdoor projects. Wagner Control Spray Double Duty is rated 4.6 out of 5 by 31. Rated 1 out of 5 by lopidy65 from Will not spray! I got this sprayer to paint my house because rolling seemed to take too long. I followed the instructions for the paint manufacturer for if paint needed to be thinned or could be used as is. I tried going slow, going a bit faster, holding it 6 to 8 inches from work. Basically went through every trouble shooting guide there was to make this thing work. Went to run water through it to clean it out and it worked fine spraying the water. So I tried to thin my paint a bit more with water (using water based paint) and still nothing. Maybe I got a faulty sprayer. But seriously disappointed that this sprayer is not working! Rated 5 out of 5 by Tommy64 from Easy & fast. Bought for my deck & wood bridge. Very easy to use. Results were better than expected. Rated 5 out of 5 by RoadWarrior from Project: Stain my deck and pergola with ease I was a little hesitant to use a sprayer for my deck as I am true believer in using a good brush to apply stain, but my wife said we should try it as it would save a lot of time. As a smart husband, I said YES!! This project would normally take me a whole weekend. When I used the Wagner Control Spray Double Duty it took me 3 hours to do my project. Awesome!! I would, however, recommend putting plastic on your home or anywhere you don't want stain to go as a slight amount of overspray can occur. Clean up was a breeze! I would recommend this product to anyone looking for great coverage in a staining project, and to save time. Rated 5 out of 5 by phatdaddychas from Excellent for the beginner or experienced user I've been with Wagner many, many years and have used primarily their sprayers. This particular sprayer caught my attention for a couple of reasons. One, it's dual material usage and two, the fact that it could be used indoors or out. The price on this model wasn't bad either considering all it's capable of doing. I originally bought this to paint and seal a trellis of my wife's and this sprayer was the perfect choice! It sprayed the material with ease, laid it right down where I wanted it and in the amount I wanted all while being surprisingly quiet! Additionally, this sprayer is easy to maintain and clean which is a real plus for me! I don't have time to spend the rest of my day cleaning a sprayer and Wagner with this sprayer made clean up a breeze. If you're considering buying a sprayer for the very first time or just need an occasional sprayer for those odd jobs, then this is the sprayer you want! It sprays both water and oil based paints and does so with great efficiency and is very stingy on the paint! Rated 5 out of 5 by ILtyler86 from Stained my whole raised deck in one day. Single handed. This sprayer did a great job, was easy to use and didn't need to be refilled as much as I thought. It did great on the ladder and in every crevous. It cut out randomly from time to time but I'm guessing that's an overheat feature. Easy to clean. Great product. Rated 5 out of 5 by T84Alum from Very easy to use and clean I bought this sprayer to finish staining our wood patio furniture. Painting by brush was taking my son and me hours. Spraying was so much easier and faster-and the results were great. The modular construction of the unit made it a piece of cake to clean. I'm kind of looking forward to the next project, which for me is something since I hate painting. Rated 4 out of 5 by Ghuman from Stopped working I was using it quite nicely. Results were excellent. But suddenly it stopped spray. I cleaned nozzle and other part well. But it throws air into the container but not spraying paint. 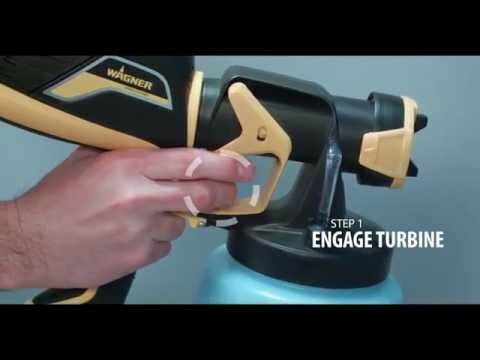 I can not understand.If gun will send air into the container then how the paint will come up to nozzle. Please explain working. Rated 5 out of 5 by Emjay from I love it! I've been using it for 2 years, 4 kitchens, and 100 pcs of furniture This is a fantastic sprayer, I love the ease of use, and clean up. It's light enough for me to spray for hours almost every day, I refinish furniture for a living. One question... Where can I buy new filters? Cheers! What size is the spray tip? Paint im using says no thinning required if its airless with a 0.015-0.019&quot; spray tip. The Control Spray Double Duty is not an airless sprayer. It uses air to atomize the material. It is good for spraying enamels, polyurethanes, and stains. Latex paint will need to be thinned out to spray it. For further help give us a call at 800-328-8251, thanks! 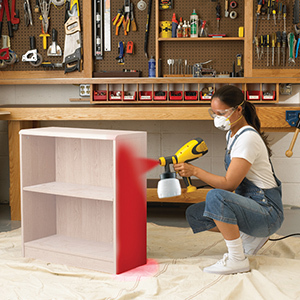 Can double duty sprayer be used with acrylic paint? The Control Series Sprayers are for staining and finishing small to medium sized projects and are capable of spraying low viscosity coatings. 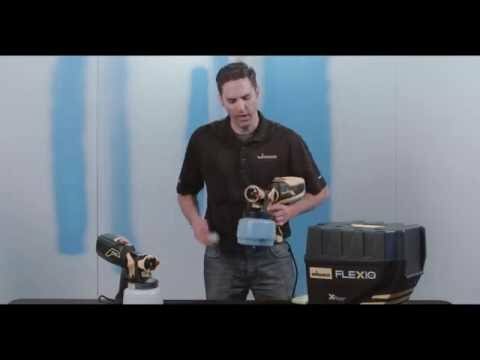 The FLEXiO Series Sprayers are a flexible solution for any type of home painting from small to large projects. The FLEXiO Series has X-boost turbine which has more power and the ability to spray thicker coatings such as latex paints and primers. The product page notes that it can be used with oil &amp; water based paints, but I have read some other reviews that suggest the unit will not work with water/latex paints. When thinning latex paints do you suggest thinning with water or a thinning agent? The Control Spray Double Duty is for staining and finishing small to medium sized projects and are capable of spraying low viscosity coatings. 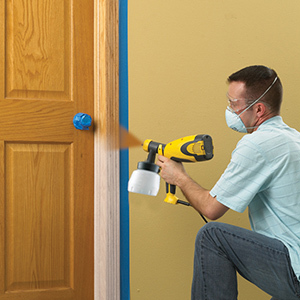 The FLEXiO Series Sprayers are a flexible solution for any type of home painting from small to large projects. The FLEXiO Series has X-boost turbine which has more power and the ability to spray thicker coatings such as latex paints and primers. Latex paints need to be thin with water. How do I get a wider flow of paint to apply? Adjusted everything we can and still a narrow coverage area. Distance and paint flow are the best controls for pattern width. Typically you should spray from about 6&quot; but to make the pattern wider go to 8&quot;. Paint flow also adds to pattern width, more paint equals a wider pattern. Keep in mind that the thicker the paint, the narrower the pattern will be overall, thinning slightly will also make the pattern spray wider. Good luck with your projects, for more help call us at 800-328-8251. I am trying to find a replacement nozzle as mine just broke. We have them in stock, give us a call at 800-328-8251. Yes, you can purchase the material container separately. It's part number 0413301. You can call for more information at 800-328-8251. Thanks for choosing Wagner! My sprayer seems to be working fine, BUT it is not pulling paint. When I stick the tube in the open jar, it blows air bubbles into the jar. Yes it does blow into the cup. That is how it gets pressurized to push paint out of it. (There is no pulling or picking up paint.) Look at the white foam gasket attached to the pick up tube, are there cross shaped slits in it? Push you finger through those, air has to get through them. For more help call us at 800-328-8251. We do not recommend painting cars with this model. It will not give you the type of fine automotive finish you'd want on your car.